The 10 days of Lincoln's city tournament were up and down, luckily ending on a high for the weekend. 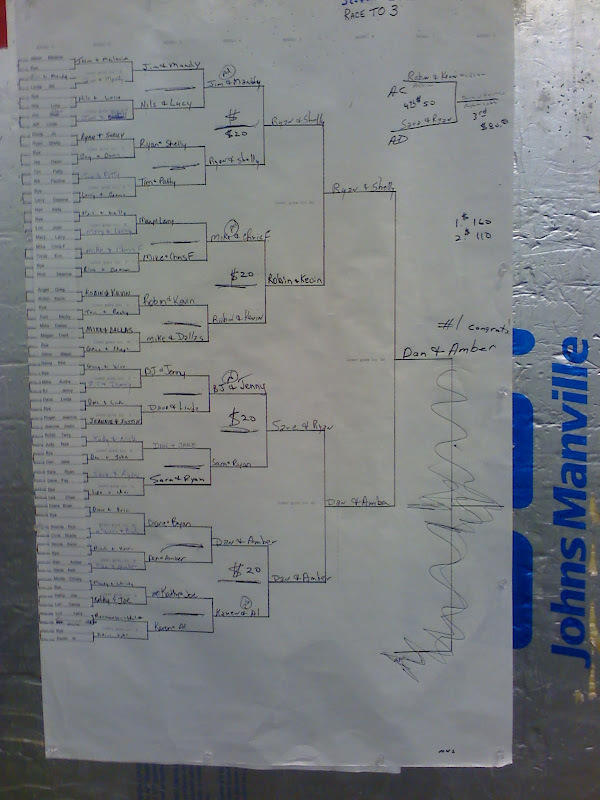 Started off playing a rated 9 ball tournament, masters had to win 4, A had to win 3, and the rest had to win 2 games. My first match was against the eventual winner of the tournament, he needed 3 games and I needed 4 games. He made a 9 on the break and ended up beating me 3-3...somehow. My next match was against a 2, and he snapped the 9 the first game...making me win the next 4 straight and I failed. Out of the 9 ball, I played a mini tournament and won $25 on a $5 entry, 8 person tournament. The finals were against a team-mate, but he got $15. Probably the same safety that I woulda played...but it ended up costing us the match with the bank luck going their way!